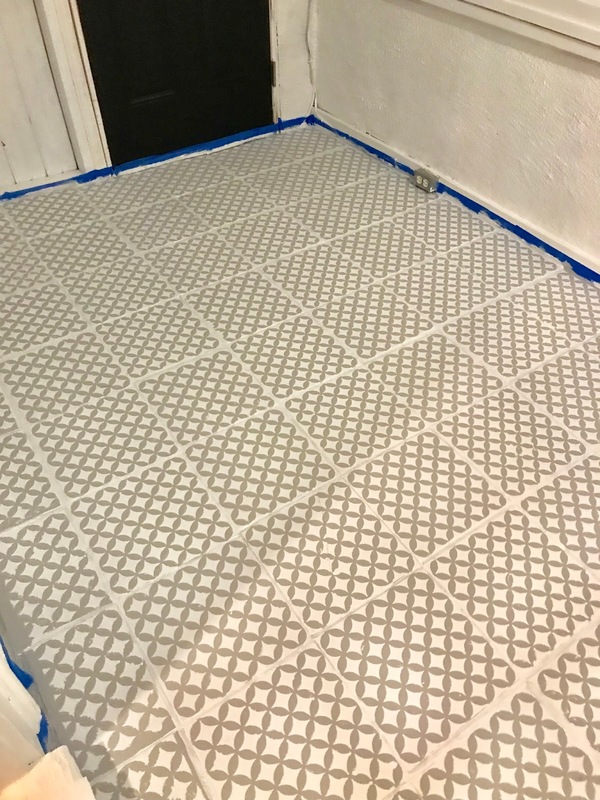 Back in November, I posted a picture of our new and improved mudroom floor slyly saying somethings along the lines of "sneak peak, coming soon! ", and then I never actually shared anything more than that. The real reason for the delay, was that the actual labor of this project so depleted me, that when it was finished I barely had enough energy to pull off any preparation for the holidays, much less a tutorial. Now a couple months out, I would say that while it was a TON of work, I think it would be a lot less if I did it a second time (now that I've learned some painful lessons). I'm so happy with the results and am already considering doing it again for one of our bathrooms. As you can see it has that "always dirty" look that everyone loved a while back because it hides the dirt. The tiles are also not lined up very well and there were a few cracked tiles. We still have those issues, but they are more camouflaged now. The first thing we did was caulk the gaps between the tile and the wall because they were significant. Then I cleaned the floor meticulously (and I hate to say I forgot to sand it, but I would do this next time). Then I painted the whole floor white with a garage floor paint. This is where I hit my first set of problems. The first problem was that the paint was not going on very well. No matter how many coats I did it was blotchy (this could be because I forgot to sand OR because of the paint, we will never know). This was solved by using a white chalk paint. The second problem was that the vision I had with the stencil was the inverse of what I had painted the floor. I should have painted the floor grey, and gone over with a white stencil. Because I was so committed to my vision, I started over (to be sure, after a good venting session with Connor) and painted the entire floor with a grey chalk paint. 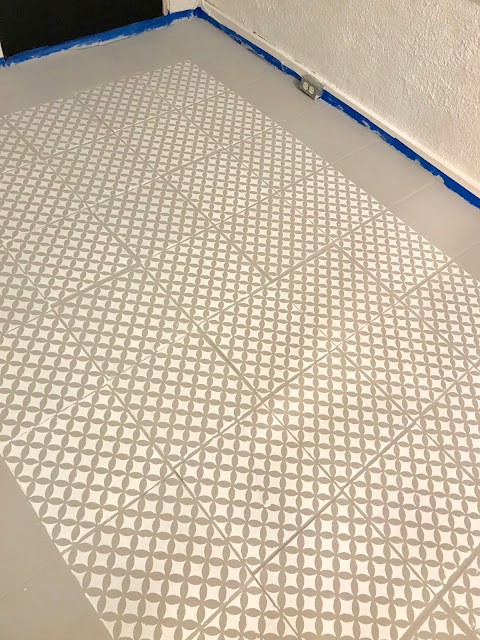 I found this tutorial extremely helpful and painted the grout lines with a brush and the tiles with a roller. The good news about chalk paint is that it dries very fast. The bad news is that once you start using it, you don't want anyone walking on the floor until you are finished putting the sealant on it, because it scuffs very easily. Then I used my custom stencil (Cutting Edge Stencils has the best customer service, they made the stencil for me to fit my exact tile size... an odd 11 5/8 inches I believe it was, and they even made the pattern a smaller scale for me), and I started doing the middle tiles in no apparent order, just so I wouldn't mess it up the wet paint with my knees and feet. 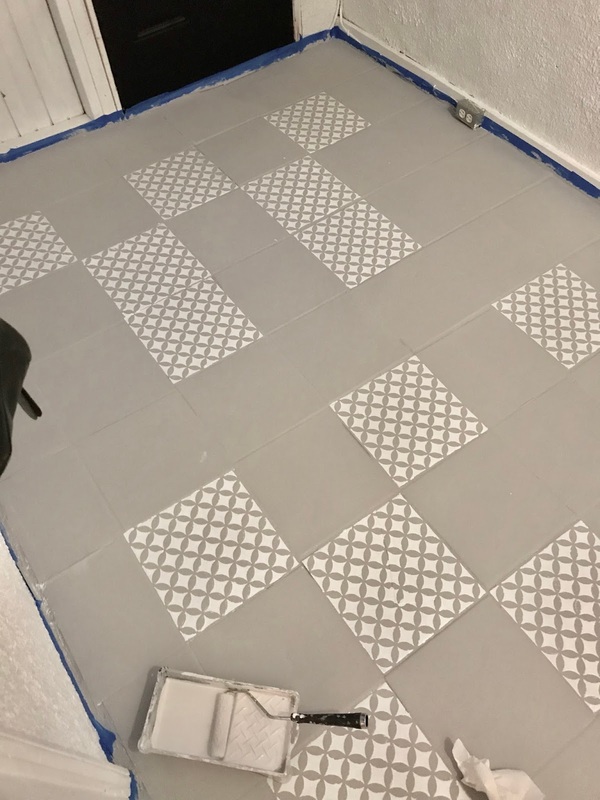 Once I was left with just the border tiles, I started stenciling those tiles (starting with the largest), and cutting my stencil down as needed. After that, I went in and painted the grout lines white, to make it look neater and brighter. Then came the exhausting part of the project where I got on my hands and knees with a tiny paint brush, and I fixed any blemishes/mistakes from when I was stenciling. Because my pattern was a smaller scale, there were a lot more of these, so I spent a lot of time on this part. In the final step, I painted on four coats of a garage sealant with a roller. I could not be happier with the results, the mud room went from being a space that was only functional (and a bit embarrassing as an entryway) to one of our favorite rooms. It is amazing the difference you feel when the entry to your home is a "pride space" instead of an "ugh" space! The tiles are wonderful. Nice work! I couldn't agree more Kate, it makes the world of difference. I would help you in a heartbeat :). Wow it looks great. You worked so hard on it I hope the paint stays on forever! You and me both:). So far, so good! very good and very useful.